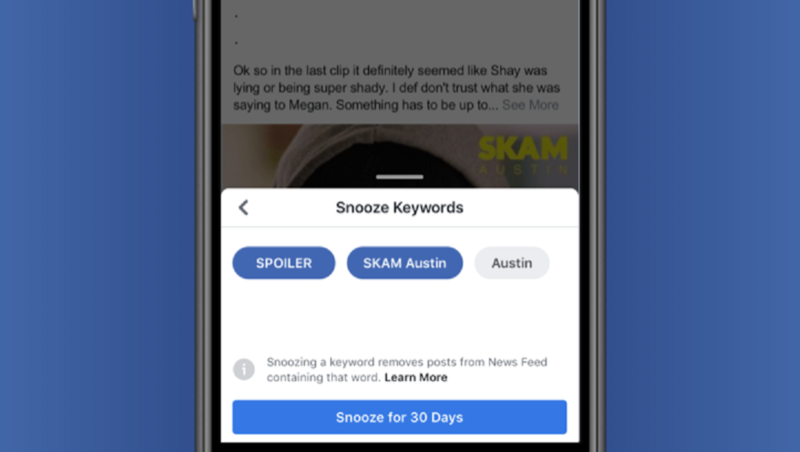 Facebook is testing a new snooze button that will enable users to hide posts linked to certain topics to help avoid spoilers. The social network's latest feature will allow users to hide any post from a person, page or group that mentions their selected phrase for 30 days. The company said the tool would work alongside its existing customisation tools such as Hide and Unfollow to enable users to tailor their news feed to suit them. "Ever read a spoiler online before you've watched the last episode of the season? Or maybe you waited years for a movie sequel only to have your favorite blogger reveal the ending? We've all been there," Facebook News Feed product manager Shruthi Muraleedharan wrote in a blog post. "To prevent future heartache, we're beginning to test the next addition to our suite of News Feed controls, Keyword Snooze. "Located in a post's upper right-hand menu in News Feed, the feature gives people the option to temporarily hide posts by keywords, which are pulled directly from text in that post. "If you choose to 'snooze' a keyword, you won't see posts in your News Feed containing that exact word or phrase from any person, Page or Group for 30 days. In other words, fewer spoilers." Other social networks, such as Twitter, already support the ability to mute keywords in posts.